With study days, finals and commencement just ahead, you can send your support and love from afar with a delivery of balloons and edible gifts to your student! Ordering online is easy; you can choose from a wide selection of balloon bouquets, snack bags, cookies and other edible gifts. Carepackages will be delivered directly to your student’s residence hall or apartment. How about a bag full of healthy snacks or some delicious block M-shaped cookies? 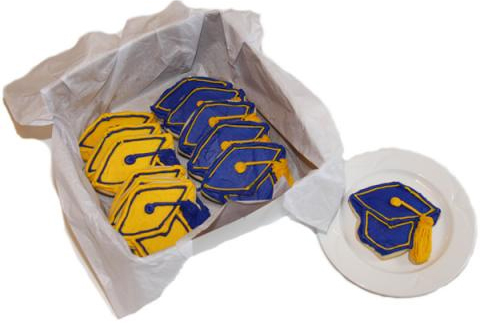 Or frosted mortarboard cookies? Deliveries are available Monday-Friday. Please allow a day or two for processing and fulfillment by our student coordinators.